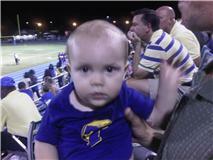 Baby Plum went to his very first high school football game on Friday. He looks serious there, but he had a pretty good time. It was very loud, and yet he managed to go to sleep on Daddy's shoulder during the first half. This is Little Elvis wearing the same shirt right before we took him to his first game. Little Elvis was younger in this picture (about 7 months, compared to Baby Plum's 11 months) so his jersey fits much better. I have it on good authority that Baby Plum will get his very own football jersey for his birthday, complete with his name and the number 86. We're getting into a little bit of a rhythm now that Bob's back to work. But that schedule will change in two weeks when Little Elvis starts pre-school. Poor Baby Plum and his new nap schedule. Guess that's one of the downfalls of being the second child. He's loving the perks, though. Little Elvis didn't have all sorts of fun HotWheels and Matchbox cars to get into when he was crawling and cruising. Little Elvis' nap schedule is still messed up. He was napping for several hours in the afternoons and then staying up until midnight --in his bed, but wide awake. Then he would wake up at 6:30 in the morning, very grouchy. I tried waking him up after an hour, but then he woke up from that grouchy and still wouldn't sleep at night. So, no naps for him. And this is what happens. Poor guy. He had just fallen asleep and woke up when he heard the camera. He's sleeping better at night, but is pretty cranky and whiny in the evenings. I miss naps (that's my computer time!) and he misses them, too. We will both be glad when we adjust to whatever this new schedule is. It's a busy, busy time in our house these days. Bob's back at work, Little Elvis and I are attempting to do without naps (it's not really working) and Baby Plum is fully mobile and into everything. Everything. Little Elvis is not always fond of his brother's mobility. Baby Plum does have a diaper on, it's just hidden by the diaper bag. That look? It's his I-need-to-get-into-something look. It's pretty constant these days. This was Buckle Daddy 4. I have no idea what incarnation of the city it really is. Little Elvis loves creating cities and parking lots. He has a little rug with roads and landmarks all over it. He likes to park his cars around certain landmarks. Here they were all parked at his barn -- some were lucky enough to park inside the stalls. Baby Plum loves these parking lots and wants to play with the cars. Little Elvis screams when Baby Plum gets too close. He likes to say, "I just don't like to share, Baby Plum. I just don't like to share." They are fighting over the latest parking lot as I type this. When not trashing parking lots, Baby Plum loves to go through his diaper bag. I'm not sure if he can open the zipper or not, maybe I'm not zipping them closed all the way closed. Anyway, if he has access to my purse or the diaper bag, you can be sure that everything will be pulled out and slobbered on. He gets frustrated with me if I pick up his treasures. There's a lot of yelling in our house these days. I'm assuming it will only get more insistent as Baby Plum gets faster. Sweet Baby Plum is a joy. His biggest hangups are being left without me, Bob or Little Elvis. If one of us is in a room with him, he's fine. But if we leave him to go get something from another room, he starts bawling. If someone else holds him, he pouts and cries. This is not something we ever really experienced with Little Elvis. Still, as long as he's got plenty to eat -- and a family member in his line of vision -- Baby Plum's happy. Notice anything peculiar about this picture? How about now? He usually sits with his little feet crossed at the ankles. He's done it since he first started sitting. My grandmother and aunts think this is adorable and unique. I don't know that it's unique, but I'm always willing to agree that everything my baby does is adorable and special. When Little Elvis was little, it never occurred to me to try avocadoes with him. So I decided to see what Baby Plum thought this time around. I'm not sure it translates, but his face, tummy and arms are all slicked with green. He's smiling because he loves avocadoes. It's a messy meal, but it's one he enjoys and that he enjoys feeding to himself. I went to a mom meeting today. It's my second meeting. The last time Little Elvis and Baby Plum were in the same room. This time they were separated. Baby Plum ended up joining me after about 15 minutes. His cries were pitiful and he wouldn't let the poor woman in the nursery work with any of the other babies. She was relieved to give him back. When we got back to the room with the other moms, his face was splotchy and he was hiccupping, but he had the biggest grin on his face. I've been feeling a little torn recently. Little Elvis' XY stage lasted all summer. And he would fuss at us if we called him by his real name. He would scream if we wrote his real name. With last year's preschool experience, I knew they wouldn't appreciate his insistence that his name was XY, RG or Scottie. What if he caused other kids to become belligerant over their names? Much as I hated to limit his creativity, we told him that he had to stop insisting that his name was XY last week. I was going to try just calling him XY at home, but his therapist said to stop it altogether. And people fussed at us last week. They thought it was so creative of him. And others continue to encourage it, which frustrates me. I'm getting really tired of people circumventing my parenting decisions. Since we bid adieu to XY, Little Elvis decided to become a superhero instead -- Super Frog. I pinned a baby blanket to his shirt for a cape and made him his own logo. SuperFrog can put his own cars up in his carrying case. That's something Little Elvis usually tells me he can't do. And he at least wears a shirt and underwear when he's a superhero. Usually when we go to the waterpad, Little Elvis has a blast. He runs and plays and thoroughly enjoys himself. Last week, Baby Plum was determined to get in on this fun. He squirmed and fussed and did his best to get out of our arms and into the water. Finally we stripped him down to his diaper (I didn't think to bring his swim trunks) and sat him in the spray. Baby Plum decided instead to summon the water gods his own way. Baby Plum had just as much fun as his brother. Both were worn out by the time we left. It's so nice to have a place with cool water for them to play in when it's so hot outside. Baby Plum is now the proud owner of four teeth. Thanks to the two new chompers, he's discovered a fun, new way to carry his toys while crawling around. Here he's set his sights on a piece from Little Elvis' wooden sign puzzle. Little Elvis wasn't happy about the toy being toted in the mouth. The battle over toys is an hourly event in our home. Baby Plum is now the proud owner of three teeth! See how happy he is to finally have that top tooth break through his gum? The other one is also on it's way. He's drooling up a storm. I realize the tooth isn't pictured, but Baby Plum is not a fan of me sticking my fingers in his mouth. That's because I'm usually digging something out of it that shouldn't be in there. Like the outfit? My grandmother and I made that for Little Elvis when he was little and Baby Plum is at the perfect size to wear it. This picture's about a month old, but it's so cute. Little Elvis went with my parents to pick corn at my grandparents. 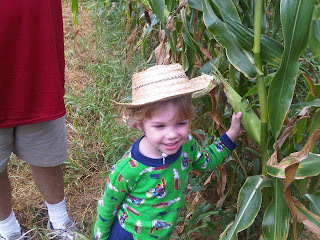 Corn's itchy stuff, and it was hot. So we dressed him in PJs. My mom added the straw hat. We took our first family vacation last weekend. It was a one-night stay at the "big city" about two hours from home. And it went swimmingly. Baby Plum enjoyed his meals out, even though he never got to order off the menu. Here he's pretending his spoon is a microphone, but he doesn't need one. His screeches and squeals are ear-piercing. Little Elvis enjoyed his apple slices, and yes, we ate out at Target. We don't have a Target in our new location and even though I don't believe Little Elvis remembers shopping at our old Target, he's been whining to go for weeks. He had a blast. We mainly shopped at stores we don't have nearby for our vacation. Both boys were great and seemed to really enjoy seeing new things. It helped that Little Elvis got a Do Not Enter sign for his bedroom and a steamroller toy. I will admit that the sheer number of toys at Target overwhelmed him. He just wanted everything. When not shopping, Little Elvis and Daddy had a blast swimming in the hotel pool. Everytime they went down, Baby Plum wanted to nurse and nap. Oh well. Sleep, while it took a little (ok a lot) of coaxing, did happen. So our first family vacation went very well. We just might do it again. Doesn't Little Elvis look like such a big boy in this picture? . He's thin with long legs like his daddy. Gone is my big, chubby baby. We no longer hear comments about our future linebacker (well, we do, but they concern Baby Plum now.) While Little Elvis is not gangly, most people are shocked when we tell them he was once just as big a baby as his brother. He also talks up a storm now. We were still concerned about his speech last year around this time, but not anymore. He's a talker. And he has no problems expressing his opinions about everything. "I don't like...." is his favorite sentence starter these days. I am constantly telling him that if he can't say something nice, then he shouldn't say anything. His reply? "But I just want to talk!" "I just want a doughnut! I just want a doughnut! I just want Mommy to make me a doughnut. I just want Mommy to take me to a restaurant to get a doughnut! I just want a doughnut! I do, I just want a doughnut, Mommy." Thankfully, the drive was less than 5 minutes. Along with his expanding vocabulary is also an expanding sense of adventure. He wants me to tell him about his 'ventures at the end of every day before bedtime. Last Friday we took him to our town's Super Fun Day. The first super fun thing he saw was a big, inflatable water slide. He stood in line (with me holding his hand) and then climbed right up the ladder. We thought he was going to demand to go back down the ladder for a second, but instead he sat..
and slid to the pool of water at the bottom. He jumped out crying, "Again! Again!" We were so proud! Usually, it takes us a long time to convince him to try something fun like that. After sliding, he painted a picture, ate a snow cone and got his face painted. Want to know what he picked out? X and Y of course. Because, yes, he still prefers (demands) to be called XandY. But it's fun to watch them "play." Little Elvis no longer spends the night with my parents. At the beginning of the summer, he said it was because he needed to "take care of Mommy." But more recently he cried because he missed his baby and wanted to see him. He loves to climb into the crib with Baby Plum in the mornings. And Baby Plum can now crawl the length of our hallway. He usually heads straight for Little Elvis' room.